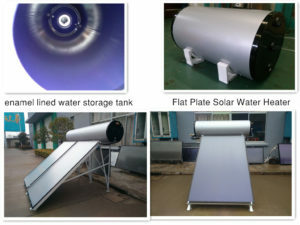 Vacuum tube solar water heater suppliers,the stainless steel and enamel solar system includes a vacuum glass tube collector that can be used with care insulation containers and non-pressurized support elements (refill containers) prior to solar water heater work,Low pressure solar water heater. The depleted glass tube area device is filled with water and exposed to sunlight, thereby heating the water in the glass tube. Heat Exchanger Manifold – Insulation pipe transfers low pressure solar water heaters to the top of the heat pipe and blocks in the heat transfer manifold of the collector. The diode solar heater, water flows through the manifold, allowing warm transfer from the copper heat pipe to the water, so the water in the tank is heated. 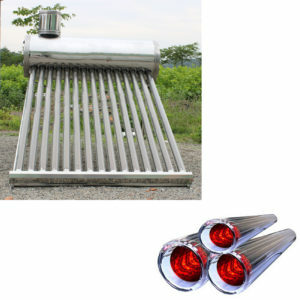 The solar Evacuated tube has high performance, high efficiency and long service life. Vacuum tube collectors are used in areas where the climate is colder, winter is longer, or where frequent overcast or overcast weather occurs. Vacuum tubes are still a good choice for warm, sunny climates, as are flat-panel solar collectors. 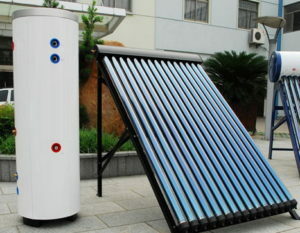 Solar water heating systems using vacuum tube collectors as heat sources overcome this problem, because solar collectors use separate circular tubes, which are always perpendicular to solar light for most of the day. This enables solar water heating systems using vacuum tube collectors to operate at higher efficiency and temperature for longer periods than traditional flat plate collector installation systems. 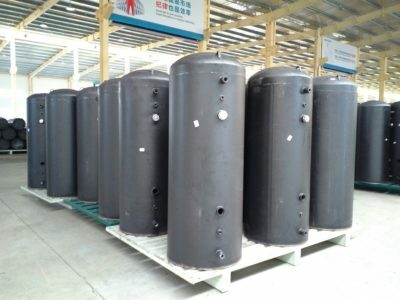 In addition, another advantage of solar vacuum tube technology is that the solar tube is not filled with a large amount of heavy water, thus eliminating the weight and roof structure problems caused by standard flat panel systems. 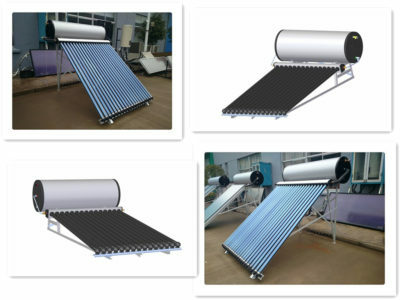 SRCC Certified Solar Evacuated tube Collector Series to provide efficient, economical and high performance solar hot water and solar space heating solutions. 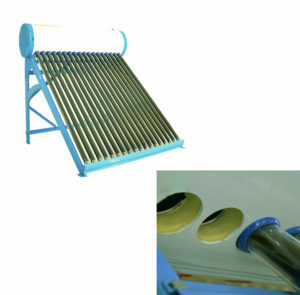 These vacuum tube solar water heater collectors are manufactured under strict quality control to ensure that the best quality products are installed in your home or business. Vacuum tube solar water heaters are devices which utilize the solar energy to heat the water from cold to hot, so they are solar products. 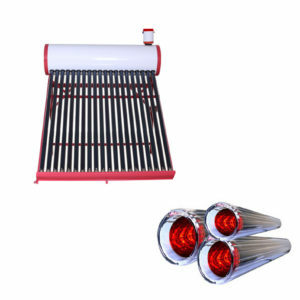 Vacuum tube solar water heaters are made up of all-glass evacuated solar collector tubes which have function to change the solar energy to heat energy, storage water tank, stand and interrelated accessories. It is well-known that the temperature of the surface facing sun is high, while the other surface is low. So that water in the tubes has different temperature, and the warmer water rises while colder water sinks which leads to circulation and at last the needed hot water produced. 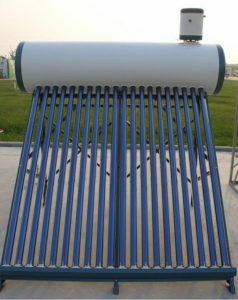 The Vacuum tube solar water heaters are one of large industries depending on the application solar energy. 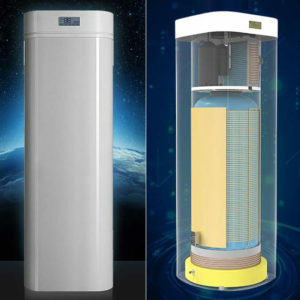 They supply pro-environment, energy-saving, safe and sanitary new water heaters for common people; solar water heaters are energy-saving equipments which absorb the radiant heat energy of sun, heater the cold water for people in daily life and production. energy savings from solar panels, However, these solar water heating systems aren’t optimized and thence unable to realize the energy savings expected despite their geographical locations and annual radiation received. Thus, these systems may be optimized supported the consumer’s desires, geographical location and also the quantity of radiation received throughout summer and winter. Absorbing solar energy and converting it into available heat. Vacuum insulation between two glass layers prevents heat loss. Heat transfer fins help to transfer heat to heat pipes. Copper vacuum tube transfers heat from ET to manifold. Insulation box containing copper head tube. The head is a pair of corrugated copper tubes with a dry connection socket, in which the heat pipe is inserted. These tubes are made of a glass called borosilicate, which is the same base material as many heat-resistant glass products used in kitchens around the world. Borosilicate glass has very strong properties and excellent transparency (> 92%@ 2mm thick). Glass wall thickness greatly affects strength, life and cost. Vacuum tubes are customized to meet stringent requirements, exceeding industry standards, including 1.8 mm thick walls, ensuring excellent strength and elasticity against hail shocks. The tube is made of low emissivity borosilicate glass (glass with very low iron content, excellent durability and heat resistance) and all glass sealing, and AL/N is used on AL selective coating, which makes the use of the whole solar energy possible. Energy spectrum generates heat. This produces higher thermal efficiency in bright sunlight, but also in cloudy or diffuse sunlight. In addition, the tube is emptied and has a barium getter (vacuum indicator). If the vacuum of the tube is damaged, the barium getter changes the color from silver to white. The combination of highly efficient absorption coating and vacuum insulation means that the coating can exceed 200 o C/392 o F, and the outer glass can be touched coolly. 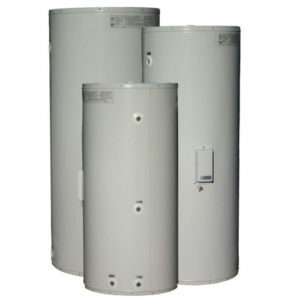 In strong sunlight, each vacuum tube can provide over 60 W/204 Btu of water heating output. How does a vacuum tube solar water heater work?